Went out filming with Alex Rankin yesterday for a Charge podcast. I had a really good day despite having the hangover from HELL. 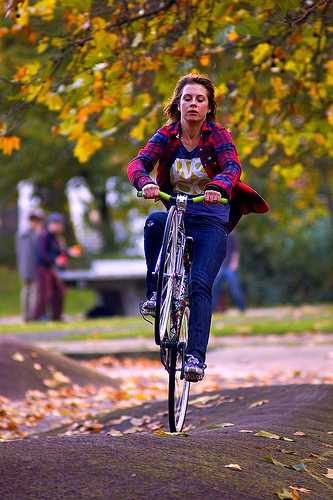 We did a few tricks up on the roof in Spitalfields, rode a BMX track up near Hackney City Farm and then went to London Fields to skid in the leaves. I managed to skid all the way over and ended up on the floor still strapped in and with my hands still on the bars. Greg Falski took some photos of us. There’s one of me below and some more here. I learnt bar spins on Saturday and I think I managed to get one on film so I’m pretty pleased about that!